Ternopil "Window on America Center" is very proud to be appreciated and rewarded by The Unated Nations Volunteers (UNV) programme. 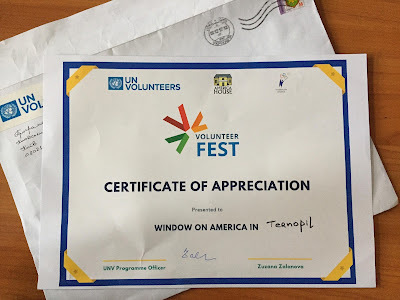 We will be very happy to be the part of the Volunteer Fest in the following year. Also Ternopil WOA and all of it's visitors and guests are thankful to Yurii Kratyuk (UN Volunteer) for his visit and beneficial opportunity!